Can use the SPM Forecast Results, ah? No! Er, maybe. Er, yes. First, they say, “No, you can’t use them!” Then, they say, “No no no! Can’t use them! A week later, “No, can’t use them because we’ll release SPM results in early March next yeat. Second Education Minister Datuk Seri Idris Jusoh said the decision was made after extensive consultation with stakeholders from various private education institutions. What he means is that private education is such BIG BUSINESS that if he wants to offend their owners and undermine their revenues, he may not be around aas minister for much longer. PETALING JAYA: After the intense debate over the forecast Sijil Pelajaran Malaysia (SPM) results, students can now use it to enrol in private tertiary institutions as early as January. However, they can only formally register for their courses when the actual SPM results are released in March. This was in contrast to the earlier circular by the ministry that forecast SPM results could not be used for enrolment into pre-university programmes. For the first time, the SPM results will be released on March 3 – two weeks earlier than the norm – to enable students to complete their pre-university courses in time to further their studies overseas. Malaysian Association of Private Colleges and Universities (Mapcu) president Datuk Dr Parmjit Singh commended the Education Ministry for being responsive to the issue, adding that it was only right that the final decision focused on the students’ needs. PUTRAJAYA: This year’s Sijil Pelajaran Malaysia (SPM) result will be announced on March 3, 2015, about two weeks earlier than before. Second Education Minister Datuk Seri Idris Jusoh said the decision was made after taking into account the views from all stakeholders following the issue of using SPM forecast results to enter into the ministry’s approved pre-university, matriculation and foundation programmes. “By releasing the 2014 SPM results earlier by about two weeks, this will solve all concerns from meeting the timing (of intake) to financial worries especially for those planning to further their studies to New Zealand and Australia,” Idris told reporters today. He added the decision would apply only for the 2014 SPM and the ministry would sit again to look into SPM examinations for the following years. PETALING JAYA: There will be no review of the ruling against the use of Sijil Pelajaran Malaysia (SPM) forecast results for enrolment into private colleges despite the recent uproar over the issue. The matter was laid to rest by Second Education Minister Datuk Seri Idris Jusoh who said the ruling was “nothing new” and questioned the recent hype over the issue. “The ruling applies for matriculation and foundation courses which are approved by the ministry via the Malaysian Qualifications Agency (MQA),” he added. Mapcu’s president Datuk Dr Parmjit Singh said the association had appealed for the decision to be reviewed. On Monday, MCA deputy president Datuk Dr Wee Ka Siong said that a blanket ban on forecast results for admission into private higher learning institutions would not work. 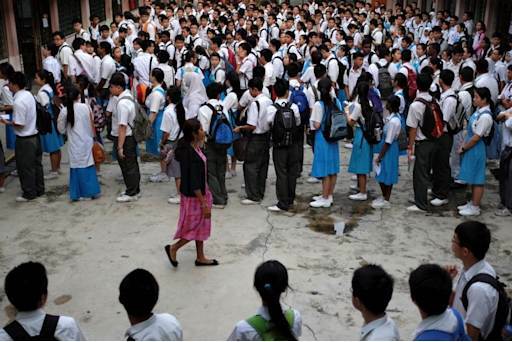 PETALING JAYA: Senior private educationists have appealed to the Education Ministry to overturn its decision to bar private institutions of higher learning from accepting forecast Sijil Pelajaran Malaysia (SPM) exam results for entry into pre-university or foundation programmes. Sunway Education Group senior executive director Elizabeth Lee said the private institutions had appealed to the Education Ministry and the Performance Management and Delivery Unit (Pemandu) when the practice was first reviewed. “My understanding then was that they would consider allowing the Tiers 5 and 6 Setara and MyQUEST institutions to continue with this practice,” she said. The Rating System for Malaysian Higher Education Institutions (Setara) was introduced in 2007 and assesses the teaching and learning aspects of participating institutions by ranking them from Tier Six (outstanding) to Tier One (weak). “Many parents don’t want their children to be idle. It could also turn into a national problem,” he said, adding that having so many free months could cause students to engage in undesirable activities. Emeritus Prof Dr Lee Fah Onn, one of the founding members of the INTI Education Group who is a council member of the Malaysian Association of Private Colleges (Mapcu), said private institutions were “doing the nation a service” by providing opportunities for students to study locally. HOW IT WILL AFFECT YOU..
Forecast results are commonly used by non-Bumiputera students for private tertiary education, and the move will put the group on par with those who must wait for the official SPM scores when applying to public universities. The change risks exacerbating the perennial issues with university placements that already exist due to preferential quotas for the Bumiputera communities. Students from non-Bumiputera groups annually complain of difficulty in gaining entry to public universities or securing their desired courses owing to the race-based entry quotas. Many are forced towards private institutions of higher learning in order to obtain the tertiary education of their choice. Others also choose to head abroad for their studies where they then opt to remain after completing their courses, contributing to the country’s brain drain. According to ‎The Sunday Star, the Education Ministry distributed a circular informing heads of private institutions of higher education that the results could not be accepted as admission qualifications. Badly affected will be all private colleges, university colleges and universities. About 30,000 students register for pre-university programmes, which begin in January, using their forecast SPM results. The Malaysian Association of Private Colleges has reportedly appealed for the decision to be reviewed. KUALA LUMPUR – SPM trial results will no longer be admissible for pre-university and foundation programmes entry beginning January, in a move that could throw the education plans of tens of thousands of secondary school leavers into disarray. The Sunday Star reported today that the Education Ministry’s decision has shocked private tertiary institutions as results from the Form Five trial public examinations have been used as entry qualifications for the past three decades. Malaysian Association of Private Colleges and University (Mapcu) president Datuk Dr Parmjit Singh conceded that the use of trial results was not officially prescribed. “In the case of foundation courses, the minimum standard of SPM results is specified and that there is no provision made for forecast results within those conditions and, therefore, admitting students based on forecast results is considered an infringement of these conditions. “However, the admission of students with forecast results has been the practice in the past three decades and allowed by the ministry,” he was quoted as saying in the weekend edition of The Star. He reportedly said students who wanted to pursue their tertiary studies in New Zealand and Australia could lose a year due to the later start of their foundation or matriculation courses. Parmjit also reportedly said results from the SPM trial exam were “highly representative” of the actual exam results and that higher grades should be imposed if the problem lay with the reliability of the forecast results. Form five students can no longer use their forecast Sijil Pelajaran Malaysia (SPM) results to enter foundation or pre-university programmes, The Sunday Star reported today. Many students told the English language daily that they did not understand why their school trial examination results were no longer acceptable, adding that the practice had been allowed by the Education ‎Ministry for decades. They said their study plans were now disrupted as they had to wait another three months for the actual SPM results to be released before they could apply for the programmes. “This can really interfere with my plans. I want to pursue an Australian matriculation programme in January and study in Australia where the intake is in February,” M. Raju, a form five student, told The Sunday Star. The SPM examinations are held for form five students every November, while the results are only released in March the following year. The Education Ministry notified heads of private institutions of higher education that such results would no longer be accepted as admission qualifications, unlike in previous years. The circular shocked the private education industry, which has over the past 30 years, relied on admissions based on forecast results. Students sit for the SPM examinations in November and results are usually released at the end of March the following year. Each year, about 30,000 students register using their school trial exam results for pre-university programmes that start in January. PETALING JAYA: Most Sijil Pelaja­ran Malaysia (SPM) students are unhappy that they can enrol in private universities or colleges only after the results of the exams are officially released. This entry was posted in Uncategorized and tagged entry into private educational courses, foundation, pre-u, SPM forecast results. Bookmark the permalink.